Antonio Brown, wide receiver of the Pittsburgh Steelers, posted a picture of himself in a San Francisco 49ers jersey next to former NFL wide receiver Jerry Rice. The photo followed rumors of Brown having altercations with the Pittsburgh Steelers. Photo from @ab via Instagram. The Pittsburgh Steelers, who finished second in the AFC North with a record of 9-6-1 this season, have been in the conversation of sports talk as of Jan. 1. 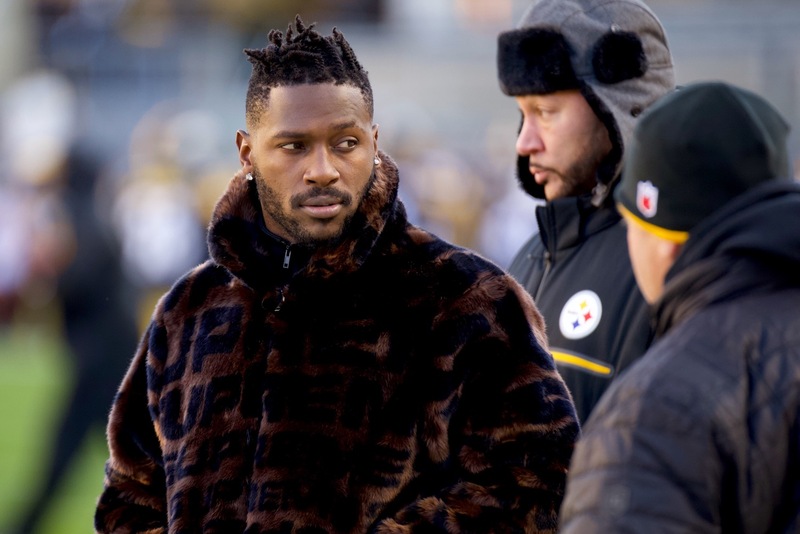 On that day, Steelers’ star wide receiver, Antonio Brown, requested a trade and reportedly wanted to be “dealt with” rather than demanded, via a tweet from NFL CBS insider Jason La Canfora. The tweet from La Canfora stated that Brown “has issues with Mike Tomlin and Ben Roethlisberger [Pittsburgh Steelers quarterback]. Feels like the coach is too aligned with the QB” via Twitter. Brown, 30, was drafted 195th overall in the sixth round of the 2010 NFL draft after the Steelers acquired a pick in a trade with the Arizona Cardinals. Since being drafted, Brown has become a staple of the NFL and for Pittsburgh football, reaching an all-time career high of 15 touchdowns in the 2018 season. After a record-breaking season, there should be no room for speculation, but after sitting out week 17 against the Cincinnati Bengals due to a knee-related injury according to Steelers’ head coach Mike Tomlin, the rumors have since commenced. Following up to week 17, Brown was absent from the team’s Saturday walk-through and also left the game against the Bengals during halftime. There have been rumors that Brown was not injured but rather benched week 17 due to an altercation with Roethlisberger during a team practice back in December of the 2018 season. Since then, Tomlin and Roethlisberger have put down any speculation surrounding a “so-called” altercation. Roethlisberger appeared on 93.7 The Fan expressing there was never a blowout and he did not recall any altercations of the sort. The absence from the week 17 lineup was followed up by the Steelers’ voting John “JuJu” Smith-Schuster (wide receiver) the Steelers’ MVP instead of Brown. Brown, who made the 2019 Pro Bowl, was fifth in the NFL with 1,297 yards receiving on 104 catches, but the statistics fell just short of first place. Smith-Schuster, who is in his second year with the Steelers, finished with 1,479 yards and 111 catches. Antonio Brown sat out week 17 against the Cincinnati Bengals. Steelers head coach Mike Tomlin said that Brown sat out due to a lower knee injury. Photo from dkpittsburghsports.com. Since then, Brown pulled out of the Pro Bowl and Smith-Schuster took his place. This brings up more speculation surrounding Brown’s trade request. Brown could in fact be afraid of the younger wide receiver possibly taking his place and title of Steelers star receiver. As of now it may seem like sports talk is being drawn out by Brown’s request, but the former MVP of the Steelers has since taken the title of “Pittsburgh Steeler wide receiver” out of his social media bios. 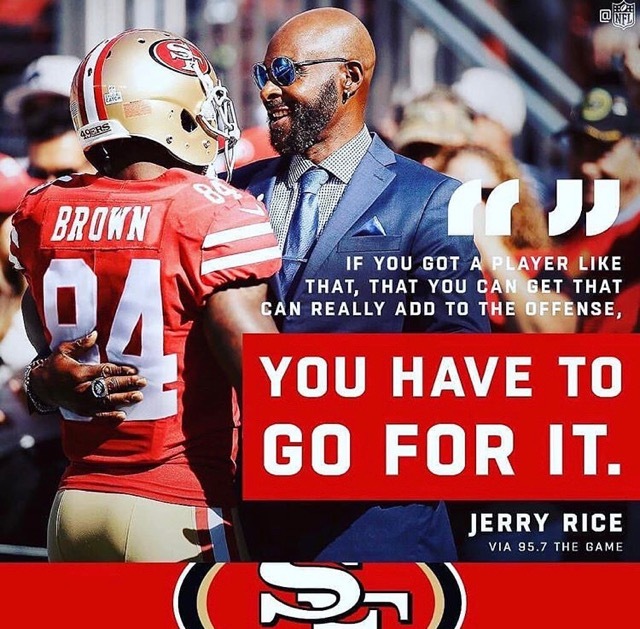 Brown also posted a photoshopped picture of himself in a San Francisco 49ers jersey with the number “84” and “Brown” name plate. Although this may or may not have been made to be intentional to the team and much rather a nod to Jerry Rice, the post was very distasteful and disrespectful to the Steelers’ organization since Brown is still under contract with Pittsburgh. The Steelers and Brown have not been in contact since the events that have taken place until recently. Brown’s manager was rumored to have been in contact with the Steelers according to ESPN’s Jeremy Fowler. The Steelers have made it public that they are willing to listen to offers for the wide out, but the details of these negotiations are all rumors at the moment. For now, as the March trade deadline approaches for the NFL, all Brown and Steelers fans can do is wait as potential talk about the next move for Brown may emerge.